I couldn't get Android Studio pick up JDK 1.8 either using just the idea.properties files. I ended up using the STUDIO_JDK: http://stackoverflow.com/a/32952022/3055345 . Maybe there's an equivalent for vanilla Idea. I downloaded IntelliJ 15 for OSX. It downloaded IdeaIU-15.0.1-custom-jdk-bundled.dmg by default. Upon startup all of my projects failed to load saying the maven projects failed to load. In the log I am seeing MavenServerManager failing to reconnect. I tried to run IntelliJ 14 with Java 8 in the past and found that I had to set java.net.preferIPv4Stack=false to get it to work. IntelliJ 15 comes with the value preset to true. I was able to download IdeaIU-15.0.1.dmg and it runs without that problem but it gives me a warning that updates cannot be automatically downloaded because it is running on Java 6. See https://intellij-support.jetbrains.com/entries/23395793 to chnage the value of this property. Disable secure updates to make it work on 1.6: http://i.imgur.com/p037pW2.png . I am not sure how the linked article helps me. I don't see any reference to Maven or running IntelliJ 15 on OSX with Java 8 - which I guess is the default download now - and the fact that the default options for it don't work. Please submit a support ticket with more details and idea.log. () -> 5 the error shown when mousing over is "Lambda expression not expected here"
When I click on Help->About I see the JRE that the IDEA is using is 1.8.0_51-b16 X86. So I created a IDEA_JDK environment variable pointing to the same Java 8 library even though the project settings already are set to point to the Java 8 library. Creating this environment variable changed the Java version the IDE is using to 1.8.0_11-b12 amd64. That is fine however I continue to get the compiler error mentioned. I found a minor bug in this workflow. Under Windows when upgrading from WebStorm 11.0.3 (x86) to WebStorm 2016.1 (x64), the IDE_HOME\jre was copied directly from the previous installation, which of course was 32-bit java and the IDE couldn't use it. Then WebStorm ignored the IDEA_JDK_64 environment variable and only tried to use JAVA_HOME which is set to Java 1.7 in my case for different platforms to use. Eventually I copied the contents of my 64-bit JDK installation's jre folder to IDE_HOME\jre and the IDE started fine. WebStorm uses WEBIDE_JDK. 2016.1 version requires Java 8 version to run. If you have Java 8 installed and run webstorm64.exe, it should find it automatically from the registry. I just downloaded the new 2016.1 version of PHPStorm. When I try to open it, it says it doesn't run with the older Java 1.6 version (which was required for the previous version of PHPStorm). So I uninstalled that and installed Java 1.8. When I type `java -version` in Terminal, it says that version 1.8 is installed. I also added a link to that Java version in the `.jdk` config file which I called `PhpStorm2016.1.jdk` (as explained above). Now when I try to open PHPStorm it says that a suitable Java version can not be found and it gives me a link to this Apple page (https://support.apple.com/kb/DL1572?viewlocale=en_US&locale=en_US) where I can download the 1.6 version. So I installed that again and then I'm back where I started, getting the message from PHPStorm that I need version 1.8 of Java instead of 1.6. Please advise what to do, because I am completely stuck and can't work. PhpStorm comes with bundled Java on Mac. If you don't have .jdk file, it should run on the bundled JDK by default. See also https://intellij-support.jetbrains.com/hc/articles/206544879. I've submitted a bug for the 1.6 installation suggestion: https://youtrack.jetbrains.com/issue/IDEA-153217. Please vote. Submit a ticket to support if you still have a problem. Serge, I have JDK 8 (x64) installed, WebStorm did not find it using the IDEA_JDK_64 environment variable, it was only checking JDK_HOME which was set to JDK 7 (x64), so it didn't start. So the JDK search sequence seems to be broken. 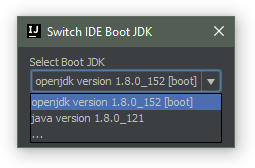 The two things that worked was either changing the JDK_HOME variable to JDK 8, which was undesirable or copying my Java 8 JDK's jre folder to IDE_HOME\jre. This works perfectly, while JAVA_HOME can remain at JDK 7, so I just wanted to share my experience. WebStorm doesn't use IDEA_JDK_64. It's IntelliJ IDEA specific. Every product has its own variable. Please check the article again. Example is for idea64.exe only. Cool, thanks! Sorry, I didn't read carefully enough. Thanks for your fast response Serge! I removed all Java versions from my machine, when I now run `java -version` in terminal, it says that Java is not installed (I even reinstalled PhpStorm and rebooted, just to be sure). Tried to fire up PhpStorm again, but still got the message that PhpStorm was unable to find a suitable Java version. Now if I run `echo $JAVA_HOME` in terminal, it tells me the location, so that works. Still PhpStorm doesn't start. I removed that line and all is fine now. Unsupported Java Version: Cannot start under Java 1.7.0_95-b00: Java 1.8 or later is required. 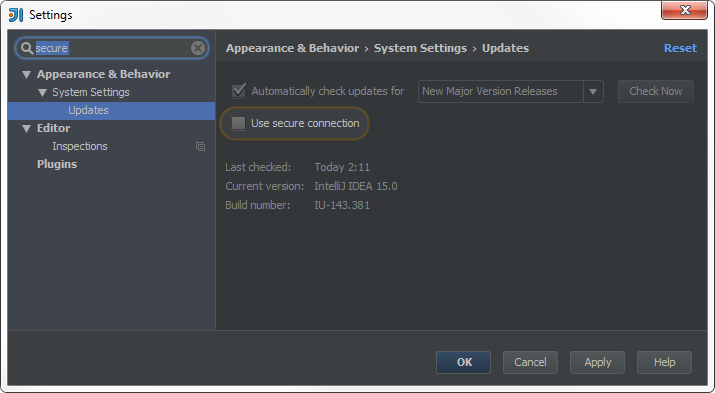 I have openjdk 1.7 installed, but as I've read, PyCharm brings it's own JRE with it. But why the contained JDK isn't used? I've tried to start the java binary in the $IDE_HOME/jre/jre/bin/ folder, but it seems a 64 bit executable. I'm on a 32 bit Ubuntu system. Is the contained JRE only 64 bit? Do I have to install JRE from Oracle? But then I have nothing of the improvements you made in openjdk to provide better user experience on Linux (like font rendering improvements and HiDPI support). Yes, we provide 64-bit Java on Linux. If you are on a 32-bit system you have to install 32-bit Java 8 manually. Why do you show an error message telling me too install one. Now i have to read tons of doku, change config files and whatever else. How about you make it that is “just works”. It is not that difficult to look in /Library/Java/JavaVirtualMachines for a java which will do the trick. It just works if you didn't modify any .properties files overriding the Java version since Java 8 is bundled by default. See https://youtrack.jetbrains.com/issue/IDEA-153217. Unsupported Java Version: Cannot start under Java 1.6.0_65-b14-468-11M4833: Java 1.8 or later is required. What a pain. But wait. What is IDEA_JDK? Interesting. Why was it null? And no I did not change any property files. At least not since the update from IDEA 15. IDEA_JDK is not needed, by default IDE will use the bundled JDK. Interesting again: Required VMs: 1.6* — where did that one come from? I checked the Info.plist — it correctly requests 1.8. 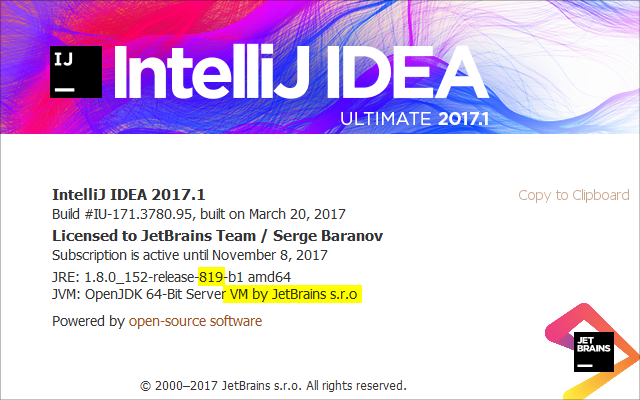 It comes from your /Users/martin/Library/Preferences/IdeaIC2016.1/idea.properties file which was migrated from the previous version, see https://youtrack.jetbrains.com/issue/IDEA-153217 that I've already linked above. For PyCharm on Mac, the file name is pycharm.jdk and not charm.jdk as mentioned. Replacing the string "jdk1.8.0_77" with whatever version of Java you have installed. So, is this JDK not supported or is this an issue? It's unrelated to JDK, please submit a ticket to support and attach a screenshot with your JDBC driver configuration (jar files) in the database connection properties. Last but not least, the Windows installer now includes our custom JDK build with fixes that address focus and font rendering issues. Is the 64-bit version slated to get a bundled JDK/JRE build with fixes for these issues at some point? Also, idea.bat seems to only want to run idea.exe the way it is written. In fact, it has one issue around 10 lines down where it is using the variable %BITS% which hasn't been set yet. That seems bad to me. Only 32-bit JDK is bundled, just like before. What has changed is that we bundle our custom OpenJDK instead of Oracle JDK like we did before. 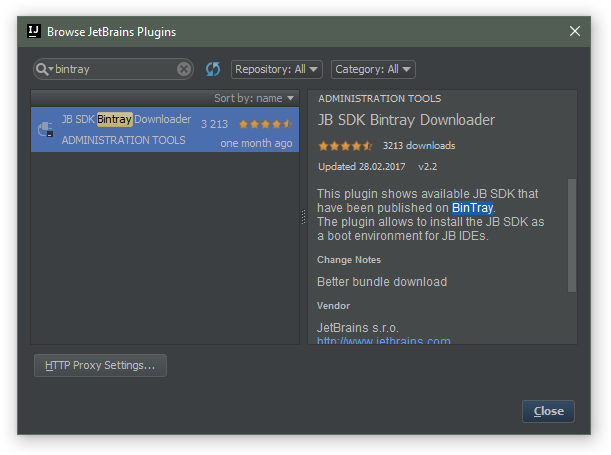 64-bit version of the custom OpenJDK is available at https://bintray.com/jetbrains/intellij-jdk/. Thanks for pointing to the %BITS% issue in idea.bat, we'll investigate it.